We’re very excited to share a bumper Site Explorer update for you today. We’ve boosted Oubound link and Inbound link reporting, added domain language comparisons, and created a sortable metric to help you judge if a link is site-wide. We have a guilty secret… we have not been telling you about all the links we know about in Site Explorer! We actually know a lot more, but we didn’t think you would really want to know. That was a mistake in underestimating the sophistication of our user base. Whilst it did make us smile inwardly knowing that our competitors have been chasing numbers that are way off our actual numbers when it comes to link counts, it caused confusion when users pulled out the advanced report in its most expanded form. The main reason for the under-reporting, is when there are two links between Page A and Page B. This is only 1 linking URL, but 2 links. The links themselves may have different properties (anchor text, image flags, no-follows) but essentially it is one referring page. The “Supplemental Index” lets us show a stronger backlink breakdown. We have also added a similar area for Referring Domains. 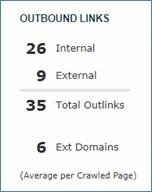 In our last update, we added the number of outbound links (internal, external, and external domains) to our Backlinks tab. 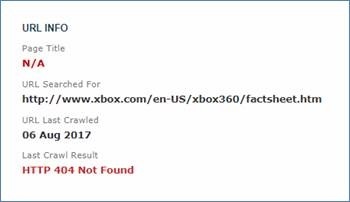 From today, you can now see this information on the Site Explorer Summary screen for ANY crawled URL. And, as you don’t want to check every single URL on a site to get a feel for the typical number of outbound links on that domain, we’ve also added an average when you search for a domain or subdomain. Here are the outbound link counts for our blog homepage (left), and the average outbound links for our blog subdomain (right). This is a great comparison…. You can see that our blog homepage contains almost twice-as-many internal links as the average for our blog, but is slightly below average when it comes to linking to external sites. This probably means that we’re blogging correctly, and helping visitors to delve into articles before sending them off to where they need to go. We’re excited about this one. What if we could tell you whenever the link is in the wrong language? Well now we can show you! Majestic had already started to identify URL languages throughout the site. However, we’ve now added language aggregation to domain and subdomain searches in Site Explorer Summary. The exciting bit is that we show both Incoming Languages AND on-domain Languages side-by-side. This makes it incredibly easy to see if a domain doesn’t match incoming and on-site language. Here are the incoming languages, and on-site languages for the Majestic blog. The small bar to the left of the language shows the average confidence for each language. At the moment, we measure language at a one-per-page level – that is, a page can only have one language. The confidence level is an average of those confidences. If we detect that the top incoming language is not the same as the top site language, we will flag this with a red banner. You can see here that the page titles and links that point to fcbarcelona.es are overwhelmingly Catalan, whereas the site is in Spanish. In this instance, this is completely understandable, but in other cases, this flag may show a mis-match between a site language and it’s incoming backlinks. Something that’s important to consider when using Majestic languages is that to determine a language, we analyse Anchor Text and Page Titles. If you’re not seeing the language that you expect, it may be because the anchor texts used on that site are in a different language to the rest of the page. Site-wide languages are only available for root domains and subdomains. We have added URL language to Site Explorer. You can find it in the slightly re-modelled area to the right of the Link Profile Chart. While we were there, we’ve colour-coded the Last Crawl Result to make it easier to notice redirects and crawl errors. The IP for a root domain has always been available in Network Neighbourhood, but it’s not intuitive to search there. We’ve added a very quick way for you to see the IP of a domain, then click that IP to discover other websites that live on the same IP address. We love Network Neighbourhood. If feedback for this is positive, we’d love an excuse to spend a bit of time on it. The new Site Explorer Summary data – at least for now – is available to ALL Majestic users. Our focus hasn’t just been on Site Explorer Summary, we’ve also overhauled the Referring Domains tab. We realised that we have so much information available for each referring domain, but we only show a slither of that extra info for those brave enough to try out the sort drop downs. To bring all of the great data out into the open, we have broken Referring Domains into five distinct sections, each capable of standing alone as a useful Referring Domains examination tool. This is the new landing page, containing headline Referring Domain information. It is exactly the same as the existing Referring Domains tab, except we’ve replaced the old (and out-of-date) Alexa Rank with one of our Outbound Links metrics, Average External Domains per Page. New on Referring Domains Tab. The links tab collects all of the link count information that we have, from the number of times a site links to your search query, to that site’s own crawled URLs, indexed URLs, referring domains and external backlinks. The exciting bit is the “Links Per Crawled URL”, that you may choose to interpret as a hint of a site-wide link. 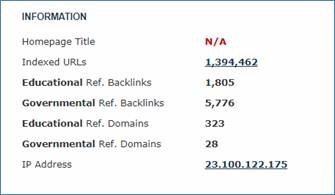 This divides the number of Backlinks to your search query, by the number of URLs we’ve crawled on that domain. The second exciting bit is that the Links per Crawled URL field is sortable. Try sorting referring domains by Links/Crawled URL and reverse Trust Flow to find potential site-wide, low-quality sites for your disavow lists. You may also notice here that the high-level metric counts are blue. That’s because they are now clickable. If you find any interesting domain, you are just one-click from drilling into their own backlinks or referring domains. This is a sortable view dedicated to our new Outbound links. If you sort your referring domains by Outbound link volumes, you can discover (or discount) links from your personal lists of interest. This is our UX guy’s favourite view. You now have all of the geographic / geopolitical information that we have on a domain. 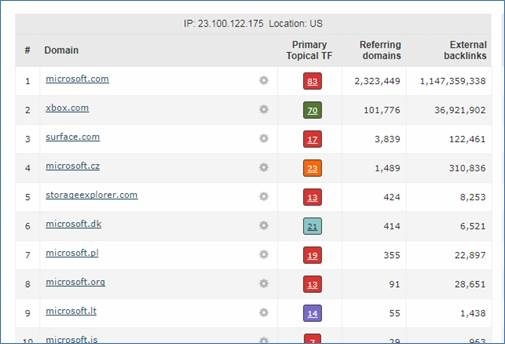 You can compare the domain languages, TL, root domain IP, and the resolved location of that IP. As in Summary, the IP address is clickable to find other sites on the same address. To help you scan down the language list, we have colour-highlighted overwhelmingly dominant languages (> 50% of detected language pages). 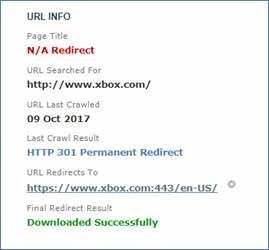 This may be one of our least-used views, but it shows exactly when we found out about a domain, and how many URLs have been indexed and crawled. Let’s face it, you don’t want the new stuff and just love it the old way. The very last toggle is to put back Alexa and give you the Classic view, just the way you like it. We have slightly improved the information that you receive when you drill into the backlinks from one site to another. Last month we moved the anchor text over to the right-hand column, thinking that we were doing a good thing. We have moved the anchor text back to the left panel. We’re also sorry if you’d just got used to it being on right and are now annoyed that we’ve moved it back to the left. We have plans for that Target URL column, so it’s staying on the right. 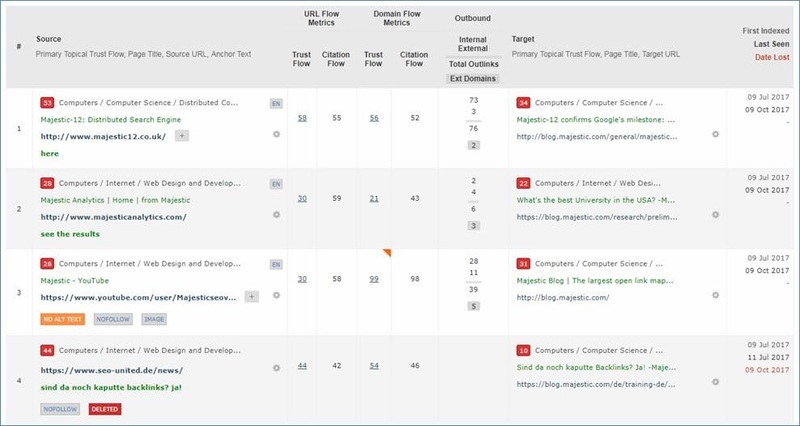 And moving the anchor text means that we have space to add a page title and Primary Trust Flow to the Target URL, so now you can compare source and target page titles, top topics, and anchor text in one easy row. 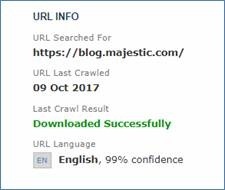 Finally, we have brought some of the new data to your Pages tab, including page language, language confidence, outlinks, and coloured crawl results. We’ve also made Referring Domains and External Backlinks clickable to help drill into the data for individual pages on your site. We’ve worked hard on bringing this new data to everyone, and we really hope there’s something there for you. Everything that we’ve mentioned is available initially on our Fresh index and may not be available on Historic yet. Smaller, or low Trust, sites may take longer to update with the new stuff. Thanks for getting to the bottom of this blog post. See you on the webinar? We noticed that the new feature related to languages (RefLanguage, RefLanguageDesc,…) is included by default in the API calls (GetIndexItemInfo). Is there a way to have the previous format without this additional info? I’ve double checked internally and I’m afraid the answer is no, there is no way to do this at the moment. We are all very intrigued as to how this would help though? Yeh – why would you want it without that information? It doesn’t cost anymore to have it. You don’t need to use it either.